"Two years after Head Start launched nationally, a class was established in my home town of Hinton, West Virginia. In a rural town like Hinton, Head Start was one of the only early educational opportunities around. It meant a lot to the families in my town, and still does. In preparation for today, I wanted to talk to someone who remembers that time a little better than a preschooler. So I had my mom call my Head Start teacher, Rita Pack." 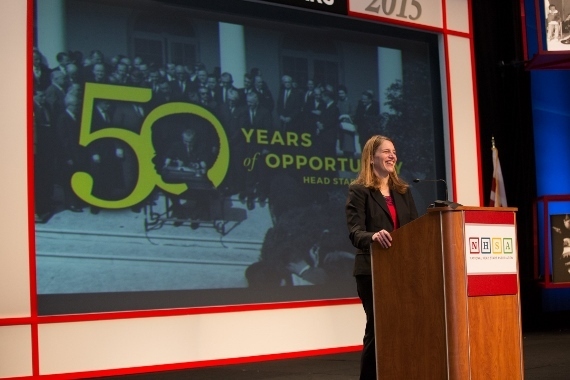 That's how United States Secretary of Human Services Sylvia Mathews Burwell opened her remarks at the National Head Start Association's Annual Conference last Thursday, with a story that contained a powerful message: Head Start graduates can go anywhere and do anything they set their minds to. During the conference's opening session, Cornell Brooks had described how his Head Start diploma still hangs on the wall of his office as President and CEO of the NAACP. Moments later, one of the founders of Head Start, Edward Zigler, proudly said he felt safe putting his life in the hands of a Head Start graduate as he chatted with Dr. John Paul Kim, who enrolled in the program as a refugee from Cambodia, and today is an anesthesiologist. The following morning, Darren Walker, President of the Ford Foundation, shared the visceral memory of a woman knocking on his family's door back in 1965 and inviting his mother to enroll her children in a new program. Over the course of the week, dozens of alumni joined us, from four-year-olds to business leaders to reporters. They come from every state, every culture, every ethnicity in America, but one piece of their stories is always the same. "I learned to love learning, and that love has stayed with me my whole life," Secretary Burwell said, echoing her fellow alumni. Then she thanked her Head Start teacher by name. In this era of outcomes and measurement, assessments and accountability, it is important to be sure our children are growing and developing on a trajectory that will prepare them for school, but the heart of Head Start will always be this unquantifiable truth: the nurturing bond between a child and a good teacher is what makes the classroom a place of safety, curiosity, and love. Fifty years of stories, thirty-two million Head Start alumni. Fifty years of the belief by communities and families that every child in the United States deserves a window of opportunity to thrive. As we celebrate the past and plan for our future, we know we must do more. Secretary Burwell called on us all to recommit ourselves and Cornell Brooks reminded us that when we stand up for giving our children the very best, we are standing up for their civil rights. Our fiftieth anniversary celebration has only begun, and we invite you to join us. There is no nobler work than making sure every child has a chance.